How to output as ping? My library is structured in such a way that it would be possible to support multiple graph backends. Now the only and default one uses Chart::Plotly, and plotly requires that "orca" to be able to export to static images. In future I will create an Alien::Plotly::Orca module to make it convenient. I install Chart::GGPlot into my CentOS server. And I run example program in this entry. I write frank comments to improve user experience. 1. Hope installation more fast. When I install Chart::GGPlot, 155 distribution is installed. I feel installation time is too long. 2. Hope Chart creating more fast. I run this example. I wait over 30 hours. In R language, Chart creating time is much fast. When I read blog entry at first, I think Chart::GGPlot is pure Perl/XS library. And I thought chart is output to png image easily. Goal and Design of Chart::GGPlot is very attractive! 1. Yes I also feel there are too many dependencies. I will try to reduce some of them. On the other hand, compared to Python and R, Perl's CPAN distributions are generally of smaller granularity. 2. "I wait over 30 hours." Oh no are you sure it's really 30 "hours"? On my Ubuntu Linux virual machine it takes from 5 seconds to 30 seconds for each of my examples to export to png. Showing in browser is faster. To be frank, that time to export to png is slow compared to R. But that's the overhead in plotly-orca. plotly-orca has a single run mode and service mode. Now it's single run mode. In future I probably can work with Pablo, author of Chart::Plotly, to support the service mode. 3. R ggplot2's graphics layers are like this, ggplot2's geom implementations uses "gtable", and "gtable" uses "grid", and "grid" is based on R's base graphics C-api. I think there be altogether ~30k lines of code in those several R libraries. 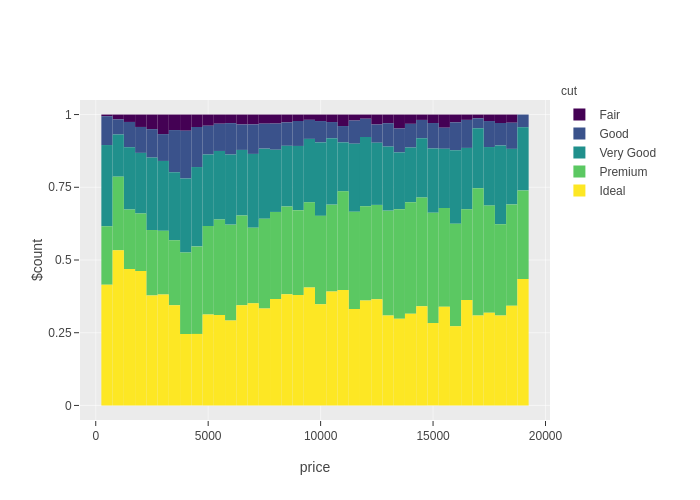 Python's port of ggplot (v1) used matplotlib as its graphics backend. For Perl there is not such a high-level graphics library of similar level of sophistication. We probably could build the layers all the way up upon Cairo, but that's too huge work for a single person. Actually before I really started Chart::GGPlot work I made an experimental and incomplete port of R's "grid", as "Graphics::Grid" published on CPAN. And then I felt I would give up that path, and instead just make use of plotly. Is it difficult to write point, line, color, text from data frame by Cairo? Cairo itself relatively low level. In R's implementaion there are multiple layers between the high level of ggplot2 and R's base graphics api, the latter is similar to Cairo. There are quite a lot implementation details there. For someone familiar with both Perl and R (like me), and based on my existing work of Graphics::Grid, it could still take 6~12 months to port all that from R to Perl in spare time. I think one of Perl lacks is Perl/XS graphic library which can create 2D/3D chart easily. If installation become easy and perfomrance of chart creating is improved as same as R language, it become more attractive for me.